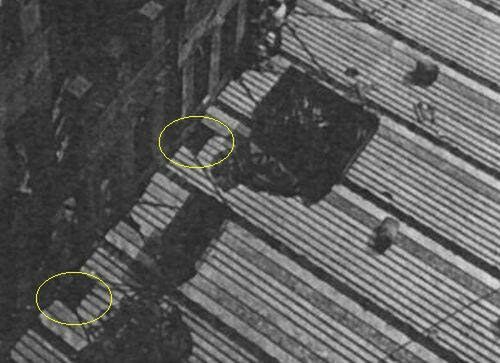 Review of videotape recordings of the collapse taken from various angles indicates that the transmission tower on top of the structure began to move downward and laterally slightly before movement was evident at the exterior walls. 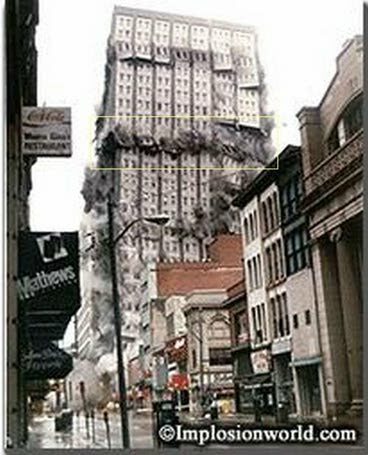 This suggests that collapse began with one or more failures in the central core area of the building. 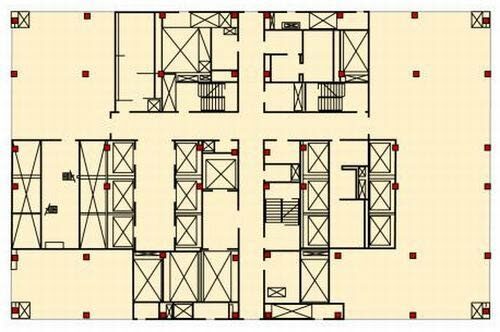 The fire-performance of steel trusses with spray-applied fire protection, and with end restraint conditions similar to those present in the two towers, is not well understood, but is likely critical to the building collapse. 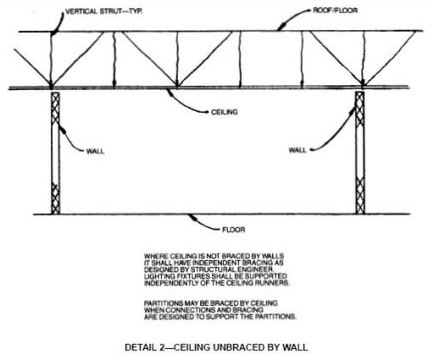 In a Nutshell, FEMA is claiming trusses that supported the floors were not solidly attached to their end supports, the exterior wall and the interior core structure. 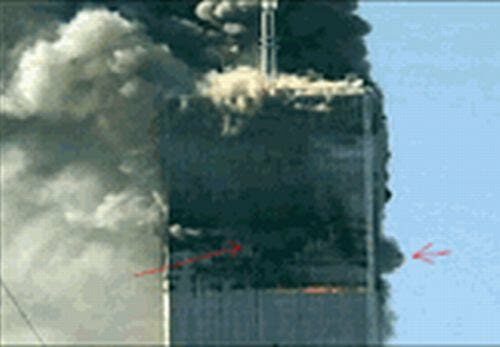 Just heat from the alleged burning fuel caused the trusses to expand falling off their supports resulting in the 'collapse' of the North Tower. Many have seen warehouses with their steel trusses supporting the roof. These trusses may or may not be attached to their supporting walls. 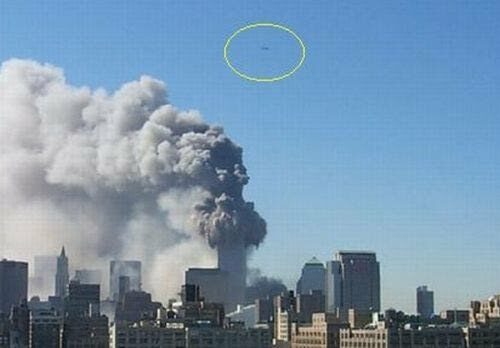 HOWEVER, the North Tower is a 110 story skyscraper not a warehouse! 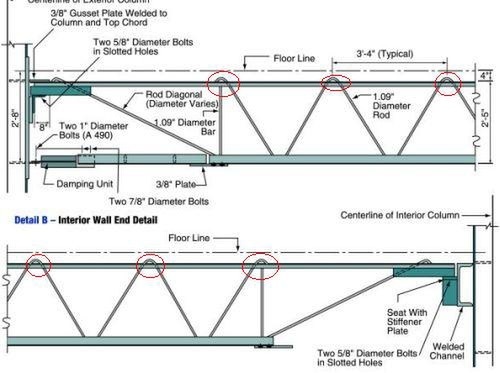 WHILE YOU ARE INSPECING THESE DIAGRAMS notice FEMA is claiming that TWO 5/8 inch bolts ONLY attach the beam at its ends. This final piece of the puzzle shows the section of the floor assembly in place with the lower rail of the assembly almost inline with the top of the windows. The assembly is heavily bolted and welded to the exterior wall brackets. 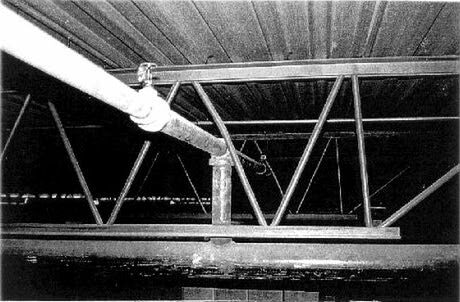 This photo shows the floor assemblies in position. 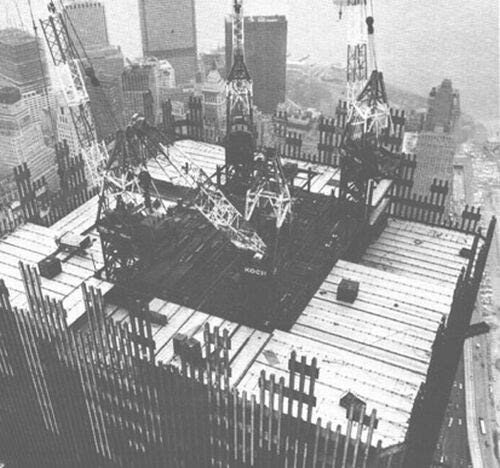 The assemblies of one floor are covered with 4-5 inches of concrete to increase the strength of the floor. 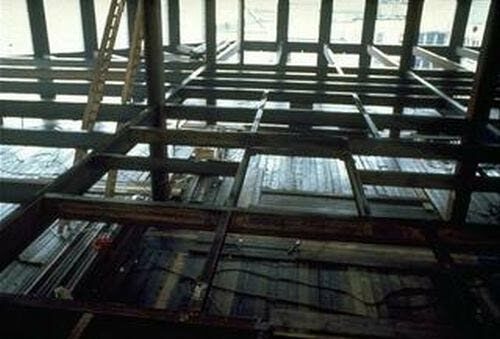 FEMA claims 'lightweight' concrete was used and thus it was weak. Since the concrete was a vital part of strengthening the floor that would be nonsense. The design concept of tubular framing (the so-called tube within a tube architecture) has been employed in the construction of many of the world's tallest buildings. These include the John Hancock Center (1105 ft), the Standard Oil of Indiana Building (1125 ft), the World Trade Center Towers (1350 ft), and the Sears Tower (1450 ft). 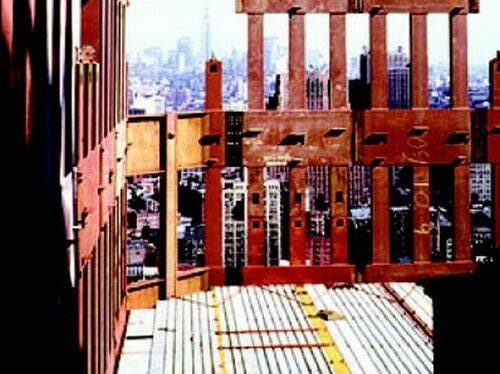 In fact, most modern skyscrapers use this design, a design which uses a specially reinforced perimeter wall to resist all lateral loading and some of the gravity loading, and a heavily reinforced central core to resist the bulk of the gravity loading. The lateral loading (horizontal force) on the building, is mainly due to the wind while the gravity loading (downward force) is due to the weight of the building (i.e., due to gravity). In the tube within a tube architecture, it is of vital importance that the horizontal forces on one wall be transfered to the other walls, so that the entire structure will bend to the minimum extent possible. It is also of vital importance that these horizontal forces be transfered to the central core so that the entire structure bends uniformly as one unit. 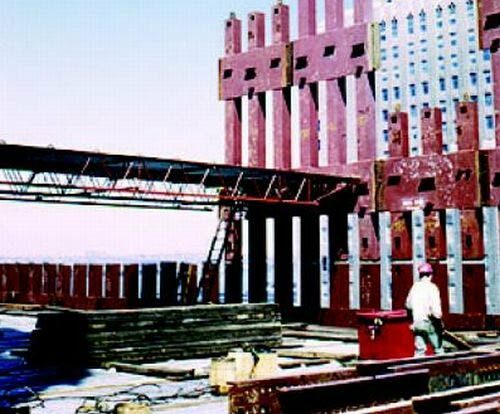 The combined steel joist-concrete slab, has sufficient strength to transfer the lateral loading to the core and the other walls, so that the building bends as little as possible, but when it does bend, it bends as a unit. THE RED SQUARES in this diagram indicate the support columns of the inner core. 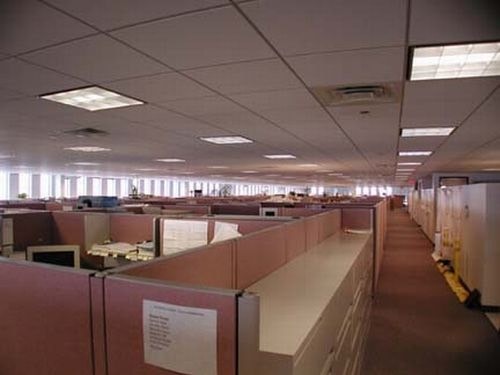 Notice the easy access to the support columns from the elevators, stairways, storerooms, etc. 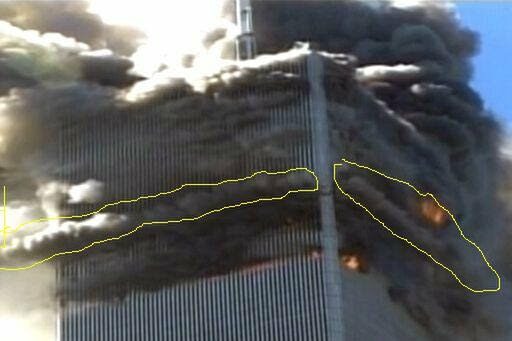 TO TOPPLE SUCH A MASSIVE CORE cutter charges would be placed on all columns and all cross beams at each floor level all the way to Ground Zero. Loizeaux said, "If I were to bring the towers down, I would put explosives in the basement to get the weight of the building to help collapse the structure." 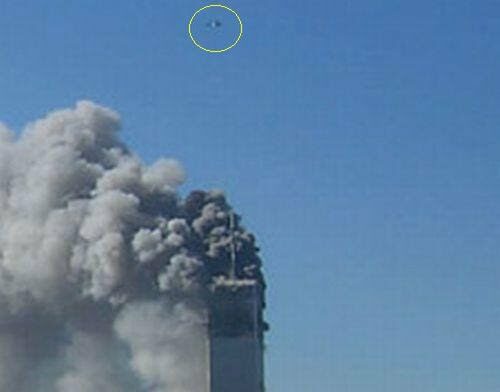 Missing Pentagon Jet Engine Identified?